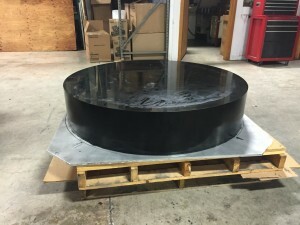 Harkness grows its aerospace business by expanding into Guerin urethane forming pads in a big way! In March 2015, Harkness produced a “Jumbo” forming pad for an 800 ton press. 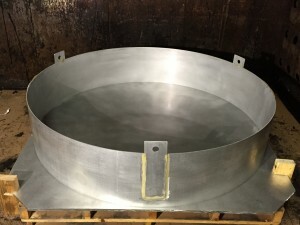 The 50” diameter x 10” thick pad weighed more than 900 pounds once completed and became single largest part that Harkness has ever manufactured. 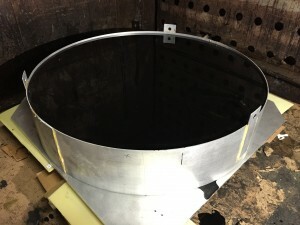 Guerin pad forming allows manufacturers to form a wide variety of shallow parts using urethane confined within a steel frame. The frame is attached to a press ram as one half of the tool. The urethane pad becomes a universal female tool and accommodates a large assortment of unsecured tools that are placed on the lower platen’s flat surface. Urethane continues to replace rubber as the preferred material in Guerin Box Presses due to its superior cut and tear resistance as well as its extended flex-life. Harkness offers a variety of urethanes in the 55 to 70 Shore A range aimed to maximize pad forming service life. Contact us at for more information at info@harknessindustries.com.